I saw the darndest thing today on my ride up north. Riding through the tiny, uninhabited hills north of the source du Lez, I passed this fellow traveller. A dog on the road. Nothing strange, you say. 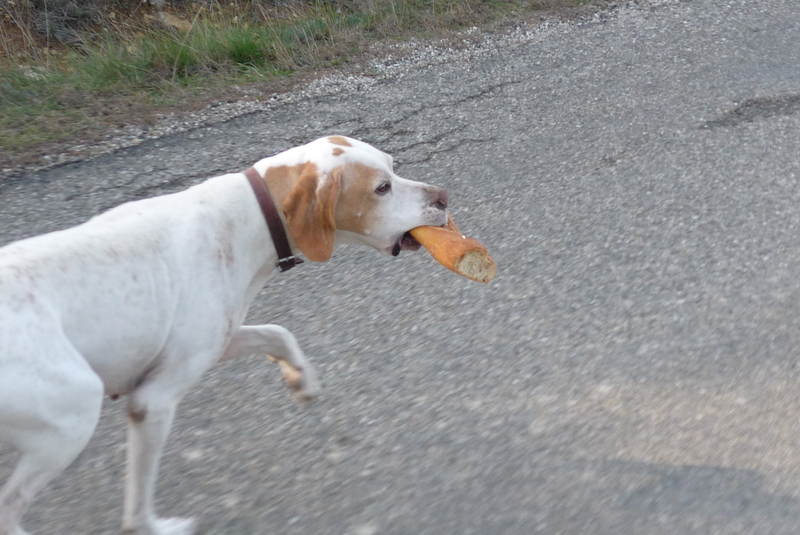 Well, not really, except this was kilometers from the nearest house, AND she had a baguette in her mouth. Even in France it’s just something you don’t see every day. 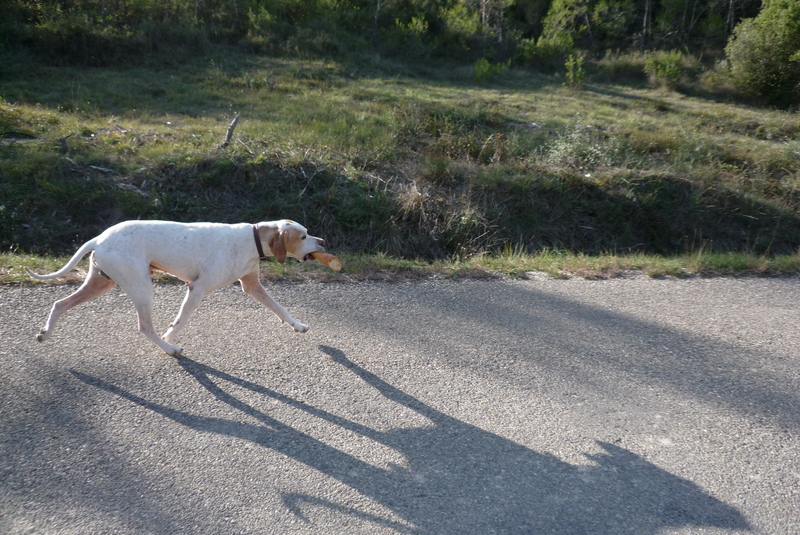 She was pretty irritated by my relentless stalking, and shortly after I took the photo above, took off into the garrigue and a quieter route home I guess. I then passed by Les Matelles and headed south. 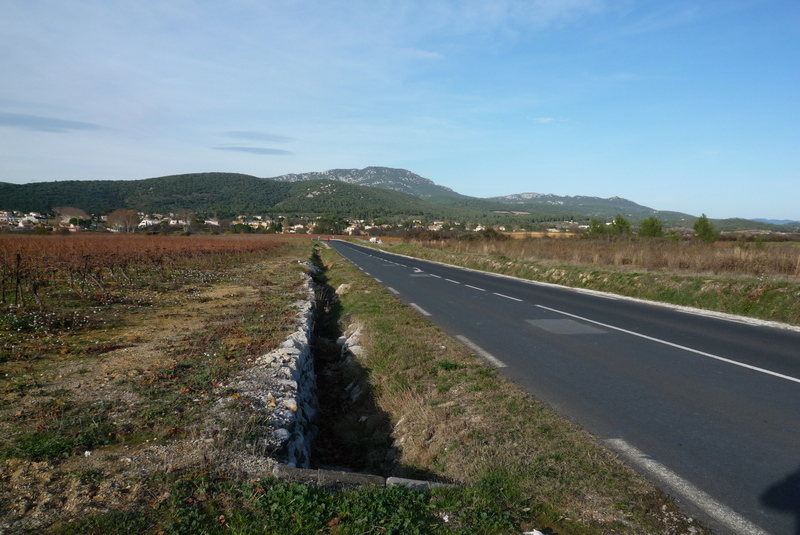 This is the village sprawl with Pic St Loup in the background. 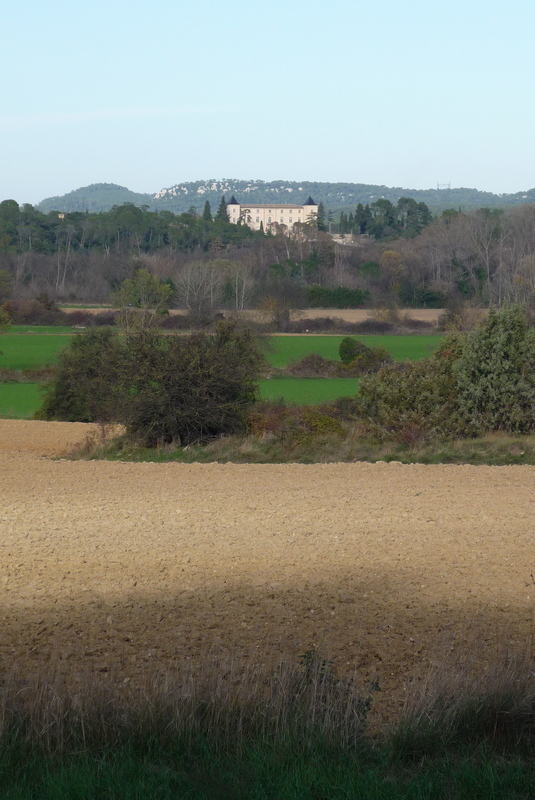 From Les Matelles I swung by St Gely du Fesc, caught the cycling path, and looped back to near Prades le Lez, where I took this photo of Chateau de Restinclières, an isolated place that is well worth a visit. It usually has environmentally-themed exhibitions, and the vast grounds are crisscrossed by walking trails with picnic spots. On the map below I’ve marked the beginning of the trail that takes you to the chateau, if you are ever in the neighborhood. There’s parking here, too. This entry was posted in Cycling and tagged chateau de restinclieres, les matelles, pic st loup, prades le lez, st gely du fesc. Bookmark the permalink. Adorable dog. I wonder if it is trained to fetch baguettes for its owner. That would be pretty incredible.